How does obesity cause disease in organs distant from those where fat accumulates? With two-thirds of us overweight and one third outright obese, I have written about the dangers of obesity since the blog began. Now comes the European Society of Genetics with news of increased risks from obesity. Barcelona, Spain: Obesity is on the rise throughout the world, and in some developed countries two-thirds of the adult population is either overweight or obese. This brings with it an increased risk of serious conditions such as heart disease, stroke, cancer and osteoarthritis. Many of these conditions do not appear to affect the parts of the body where the excess fat accumulates, but rather to involve body systems that are remote from the fat accumulation. Now an international group of scientists has taken an important step towards understanding the links between obesity and the related, yet physically distant, diseases it causes, the annual conference of the European Society of Human Genetics heard yesterday. The researchers found simultaneous changes in response to obesity in almost all the tissues studied. “These results show that obesity really is a systemic condition, and particularly a condition of systemic inflammation. Interestingly, though, the changes in tissue function appeared to be only partially shared between different types of tissues; some tissues clearly act in pairs with one half of the pair compensating for – or enhancing – the dysfunction of the other. For instance, adipose tissue and adrenal glands, which are both organs secreting hormones essential to metabolism, often react to changes in BMI in completely opposite ways, including a decrease in metabolic activity in the former and an increase in the latter,” Ms Tukiainen will say. Although lifestyle changes are the most effective way to combat obesity, they can be hard work and difficult to maintain. Therefore the biological processes identified by the researchers may help the treatment of obesity by identifying potential drug targets, and particularly tissue-specific targets, they say. The results may also help to distinguish groups of individual who are at higher risk of developing complications, and lead toward personalized care. “Our research highlights the burden of overweight and obesity on the digestive system. Although this is unsurprising, given the role of digestive system tissues in food processing, we found alarming links between BMI-related changes in different parts of the digestive tract and genes implicated in some diseases, for example Crohn’s disease. “An association between two variables does not necessarily imply there is a causal link and, from the gene expression results alone, we cannot tell which is driving which. Do changes in BMI or changes in gene expression come first? We can, however, address the potential causes by using genetic variants known to be associated with BMI in combination with our data on gene expression,” says Ms Tukiainen. Large-scale genome-wide association studies have already identified nearly 100 genetic variants that influence BMI. Analyses by the group that interpret this information further have shown that many of these gene expression changes, particularly in adipose tissue, appear to be caused by increased BMI. “I believe that our work adds to the weight of evidence, and provides hypotheses for other researchers to follow up in the hope of being able to translate the results into ways of preventing and treating the very serious complications of obesity,” Ms Tukiainen will conclude. *GTEx is a dataset consisting of thousands of tissue samples in which the RNA from each sample has been sequenced to measure gene expression. Because it is not a dataset collected specifically for obesity research, the donors are representative of the population as a whole, and the obesity epidemic is clearly reflected in that only 31% of GTEx donors are or normal weight; the remainder are either overweight or obese. What are some obesity statistics? Eat less; move more; live longer are words to live by. I am now in my seventh year of writing this blog on Food, Exercise and Living Longer. Nearly a million people have read posts in that period and the readership grows on a daily basis. 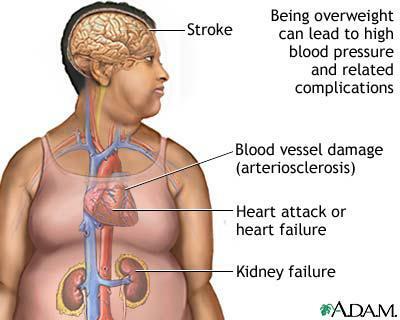 So I was very surprised to learn that with all the increased sensitivity to nutrition, yoga, cross fit, exercise of every stripe, it seems, heart attack patients are getting younger and more obese. Despite increased understanding of heart disease risk factors and the need for preventive lifestyle changes, patients suffering the most severe type of heart attack have become younger, more obese and more likely to have preventable risk factors such as smoking, high blood pressure, diabetes and chronic obstructive pulmonary disease, according to a study scheduled for presentation at the American College of Cardiology’s 65th Annual Scientific Session. The new study analyzed heart disease risk factors among more than 3,900 patients who were treated for ST-elevation myocardial infarction, or STEMI–the most severe and deadly type of heart attack–at Cleveland Clinic between 1995 and 2014. What Is the Co$t of Obe$ity? I have talked about overweight and obesity statistics here repeatedly. By now, is there anyone who doesn’t know that 60 percent of us at overweight and 30 percent of us outright obese. You can read chapter and verse on How Does Obesity Affect You? personally. We have let ourselves go to the point that employers are now paying for it. Typically 20 percent of a company’s employees drive 80 percent of the health-care costs. and about 70 percent of the costs are related to chronic conditions resulting from lifestyle choices like overeating or sedentary behavior. Companies, trying to get control of their rocketing healthcare costs, are fighting back. Last month CVS shocked some employees by asking for personal health metrics, like body fat, blood sugar, etc. or pay a $600 penalty. Michelin is adding as much as $1000 to health care costs of employees with high blood pressure or large waistlines. After talking and writing about this for over three years, I wonder what it will take to get folks to do something about their personal health. If you are reading this blog, perhaps that can be a first step. Check out How to Lose Weight – And Keep it Off. I have written a number of times about the sugar content in various foods, Why You Shouldn’t Drink McDonald’s Frozen Strawberry Lemonade is one example. The drink has 67 grams of sugar in 16 ounces. That amounts to 15 teaspoons full. As is the case with salt, there is a lot of sugar hidden in processed foods. The key idea I try to get across here is there are 4.2 grams of sugar in a teaspoon. People read the sugar content in grams and it just doesn’t register with them.